No other abs exercise can provide you the same level of challenge and satisfaction when done correctly. We are talking about the one and only dragon flag. Even if you were not raised on the 70s martial arts films or 80s action movies, chances are you have seen this exercise before on screen. It looks tough and feels rough, with just enough challenge to keep you motivated until you finally master it. What is a Dragon Flag? A dragon flag is a strength training exercise focusing primarily on your abdominal muscles as well as back and leg muscles. It is similar to some other abs exercises like leg raises but what puts it aside from the rest of the bunch is the difficulty. Dragon flag is not an easy exercise and we would certainly not recommend it for beginners. However, if you have at least a few months of training experience and would like to pose a new challenge for your abs, look no further. Before we take a deeper look into the exercise and its technique, let’s learn a little bit more about its origins and what makes it so cool. Why is it called the Dragon Flag? The exercise takes its name after the late and great martial artist Bruce Lee who popularized this body movement. Several of Lee’s movies featured the word “dragon” in their title (Way of the Dragon, Enter the Dragon) while Bruce Lee himself was often referred to as the “Dragon” due to his exceptional strength and agility. Why the flag? Because your body resembles a flag waving in the wind. That’s Bruce Lee performing a dragon flag. You might also remember this scene from the 1985 movie “Rocky IV” starring Sylvester Stallone. The quality is also from that year. So, these are dragon flags alright. What’s so great about the dragon flag? This is, actually, one of the hardest exercises you can possibly do to train your abdominal muscles. It’s certainly not meant for beginners – only athletes with at least a month’s experience can handle it. Even so, there’s a huge chance you might not do it right from the first try. The goal is to build your abs stamina and the overall technique gradually by performing similar exercises, which includes parts of the dragon flag moves. Once you have mastered the most common dragon flag variation (flat bench, straight legs), it’s nowhere near the end. Besides the obvious “more sets, more reps” routine, there are plenty of other dragon flag variations, such as bench decline, ankle weight, and negative dragon flag repetitions. If you think you’ve seen it all, try the latter. Certainly not a basic exercise, the dragon flag is there to further increase your muscle strength and raise your abdominal muscles separation to the next level. We would definitely recommend this exercise for anyone who wants to achieve that perfectly “ripped and toned” six-pack look on their body. 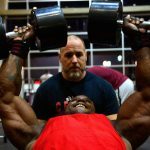 What a great way to earn respect from your fellow bodybuilders, isn’t it? As with any new and challenging exercise, there is no need to rush – you would probably want to build up some strength required for the real deal and get accustomed to the body movements and positions. To achieve that, we offer you a set of simple exercises that you might have done in the past and know well. Let’s take a look at how to do them. One of the easiest and most beginner-friendly abs exercises, hollow body holds are great for getting you started on the abs workout. They are a step forward from the previous exercise – if you’re good the hollow body holds, you will master hollow body rocks in a jiffy. Here’s a video showing you the right technique for hollow body rocks. Another step forward, lying leg raises are quite similar to the dragon flags, albeit much easier to perform. Just remember to keep your upper back glued to the bench, and try to perform this exercise by lowering your legs very slowly. This way you’ll get the right feel. Again, to raise the stakes, you should use the pull-up bar for this exercise. The principle is the same as with the previous exercise – raising your legs in front of your body while trying to keep them straight. That should be enough to get your busy for a couple of weeks. Now that you’re agile and strong enough, it’s time to do your first attempt at the dragon flag. While still similar to the original, it’s not the real dragon flag yet – that’s why we called it incomplete. Doesn’t mean it’s easy to do, though. Let’s see how they are done. Lie on a bench as if you were going to do lying leg raises. Grab the front end of the bench (where your head is) with your hands, bend your knees, and start lifting up your hips while keeping your lower back straight and your abdominal muscles tight. The further you get your knees from your chest, the more difficult this exercise will get. If you can’t keep your lower back at first, let it stay rounded but not for long – your goal is to make it perfectly straight during the exercise. This is as close to the real dragon flag as you can get. The only difference between the two is that in this exercise one of your legs is bent and the other is straightened. The rest is the same as in the previous, tuck dragon flag, exercise – flat bench, straight back, tight abs. These exercises should put you in the right form to proceed to the final step – the real, complete dragon flag. One important thing to consider – DO NOT arch your lower back. If you want to get the maximum of the dragon flag, keep your lower back straight at all times. Congratulations – you’ve just done a dragon flag! 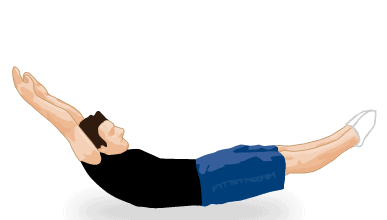 Dragon flag is a great exercise for building your abdominal muscles strength and shape. It’s hard enough to prove a challenge even for some experienced athletes so we recommend having a couple of months of training experience under your belt before proceeding to the dragon flag.